Foundation is the basis of your makeup. You want your makeup to cover, yet have a breathable texture to it. Never do you want to feel like you are wearing a mask on your face all day long. L'Oréal Paris has come out with its first breathable foundation that lasts all day long (and I mean literally up to 24 hours) yet it lightweight. It is a medium to full coverage foundation. This breakthrough longwear foundation with breathable-skin technology lets your skin shine through but covers flaws, blemishes and allows the skin to breathe. The formula's three oil absorbers resist sweat, water and transfer. It has an ultra-thin liquid formula that goes on smoothly to give the face a healthy looking complexion that lasts all day long. Color stays true and blends in evenly all along the skin, so makeup looks fresh all day. It is non-comedogenic and formulated with SPF25 (octinoxate 6.7% and titanium dioxide 3.9%). It does contain one chemical and one mineral sunscreen, so if you are allergic to chemical sunscreens, you will not be able to use this product. This foundation is suitable for all skin types, even acneic. It comes in 30 shades for every skin tone. I tried 2 shades: Pearl 400 and Porcelain 405. Both shades look great on my skin tone. I am very pale with a neutral skin tone and thus can wear almost any light shade foundation. I found that this foundation was easy to build up in coverage, it went on in medium coverage and I used a beautyblender sponge to apply it. I start at the inner portion of my face and work outwards, stippling the foundation as I go. Using the damp sponge I keep working it outwards until all of the foundation has been applied and blended outward. I make sure I am happy with the coverage and then I apply a light dusting of translucent powder over the top to set it. Infallible Up To 24 HR Fresh Wear Wear SPF25 does not look at all muddled but does indeed look fresh and you can still see the skin underneath. Even with full coverage, skin looks smooth, clean and fresh. I personally like medium-full coverage foundations, as I like to cover up all of the sun damage on my face (re: freckles) as it makes me look less like a teenager and look older and more professional. Another thing I like about this foundation is that is comes in such a large range of shades. Cosmetic companies have been listening to customers complaints and have started to listen. Customers want a larger shade selection. Especially in mass market foundation. And when you are spending $14.99 on a foundation, which is close to department store pricing, they want high quality, shade matching and a product that will satisfy their needs. As you can see from above, there is very little difference in the shades Pearl and Porcelain. Both are the lightest shades offered in this foundation. I would say they would work well on cool and neutral skin tones. Not warm skin tones. I cannot wear foundation with warm undertones but I can wear makeup colors with warm undertones, so I am not sure what gives there, it must be the neutral side of my skin tone. The only thing I do not like about this foundation is that the liquid is a little thin and it tends to run when applying it to the sponge. Otherwise, it is a great foundation and I think it will work well for many people. 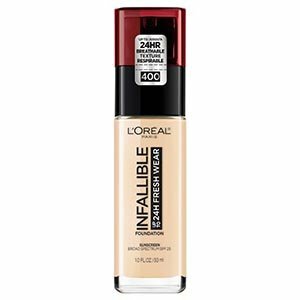 L'Oréal Paris Infallible Up To 24 HR Fresh Wear Foundation SPF25 is available at mass market retailers such as Walgreens, CVS, Rite-Aid, Target, Walmart and Ulta. It is available online at www.lorealparisusa.com and www.ulta.com. Like L’Oréal Paris on Facebook: https://www.facebook.com/lorealparis; Follow L’Oréal on Tumblr:http://lorealparisusa.tumblr.com/; Follow L’Oréal Paris on Twitter: @LOrealParisUSA; Subscribe to their YouTube channel: http://www.youtube.com/user/lorealparisnyc and Follow L’Oréal Paris on Instagram:http://instagram.com/lorealparisusa.